My favourite weekend eggs are soft-boiled–and for 6 minutes exactly, not anywhere near 7. 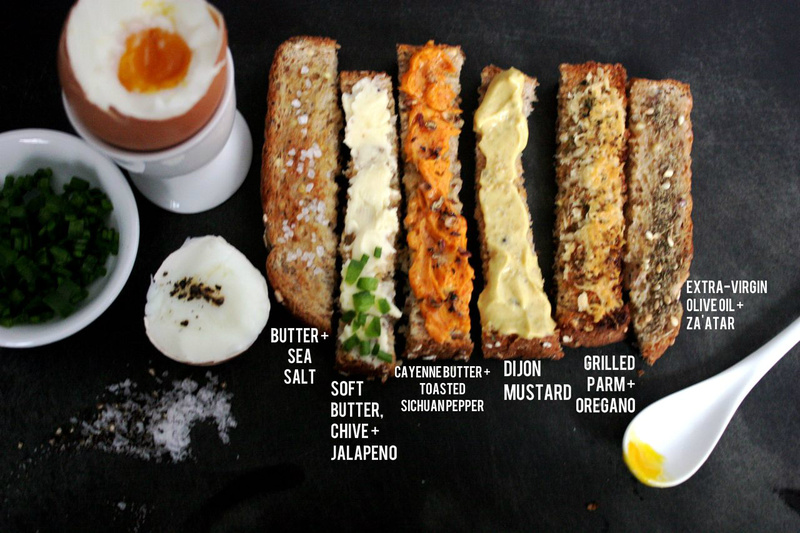 Using the freshest eggs counts for a lot but beyond that, it’s all about the toast “soldiers” for dipping into the eggs. Plain old toast smeared with butter is great, but a sprinkle of Maldon salt and fresh pepper on that butter makes the plunge into a soft yolk so much more enjoyable. And what if that butter was spiced with korean chili flakes and topped with toasted Sichuan pepper, or if those soldiers were positively covered with grated Parmesan and oregano and before being grilled under a broiler until golden? Well that would be downright egg-citing. What? Sorry. What a beautiful gathering of special toast soliders, Yasmin. I am thinking of doing a chocolate chip brioche soldier this morning! Yum. I do love your idea of having different spreads for each toast. i would never think to do a sweet version–hope it turned out well!